Spectacular new construction with filtered lake views, private hot tub, air hockey table in bedroom 4, huge open great room with river rock gas burning fireplace, and high speed wireless internet! 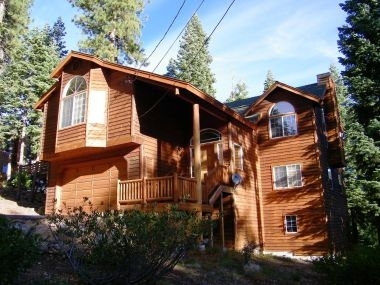 This wonderful home is located perfectly with access to Tahoe City in just a few minutes, and only 15 minutes to both Squaw Valley and Northstar Ski Resorts. Beautiful upstairs deck with gas barbecue and fabulous mountain views with a peak of the lake. The master suite is wonderful with a huge bathroom with jacuzzi bathtub and double vanity. Downstairs you will find bedroom 5 which can also be used as a family room with queen sofa sleeper and TV. Book now for the perfect vacation!